In 2000, I predicted that we would see innovation as a service in the near future. NASA recently invited users from freelancer.com to help them solve 22 of their most complex problems. 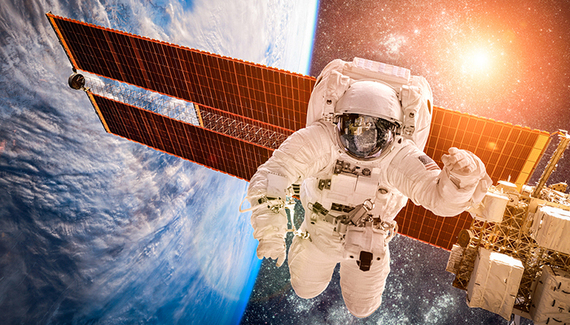 The open invitation to join a collaborative innovation program that involves training the image recognition of the robotic astronaut by generating 3D models of objects that it would interact with on the EVA spacewalk, including , and of the International Space Station has captured everyone's imagination. The first contest just closed and received over 3,300 entries from freelancers from all over the world aspiring to work with NASA. Welcome to the world of crowdsourcing innovation, where even the has asked their electorate for ideas ahead of their 2016 Budget. Sure, they could be accused of jumping on the bandwagon or proving they are running out of ideas themselves, but it illustrates how this relatively new concept has quickly grabbed the attention of both business and society. The use of crowdsourcing to identify new ideas provides a much needed fresh pair of eyes to focus on complex situations that is not only embraced by small start-ups and businesses but increasingly by household names who are happy to admit that they don't always have all the answers. It is quite poetic how NASA is leading the way with this forward thinking crowdsourcing innovation exercise that encourages collaborating with others who have a shared future view. In many ways, it's incredibly refreshing to hear how some of the largest organizations in the world are open to innovation and accepting help from outside of their organization. They understand that no matter how smart they consider themselves, big problems can be solved faster when you get a world filled with caring innovators involved. Combining the collective ability of 17 million freelancers to design a robot arm that NASA engineers need help with sounds like a Hollywood movie script. However, this is a stroke of genius that recognizes the depth available using the international talent at their fingertips by just asking for help and it's this collaborative solutions approach that can be the difference between success and failure. Solving a complex problems that requires innovative ways to approach a solution by involving anyone with an idea feels like a watershed moment. Where the human race has evolved to a point of realization of just how much of a difference we can make by gathering the thoughts of each and every one of us to collaborate and solve those big problems together regardless of any geographical constraints that held back our predecessors. The thirty individuals whose ideas are selected will receive a $10 payment while a $100 fee would be paid to those who managed to provide all of the deliverables in the task, but an opportunity like this will never be about the money. Being the person who can proudly say they were fundamentally involved with helping NASA get a flying robot that assists astronauts in accomplishing tasks aboard the International Space Station would be more than enough for most people reading this. It's fascinating to see how our new digital sharing economy led by global idea generation is placing a stronger importance on innovation, collaboration, and anticipation. We finally recognize how we can all use our unique experiences, perspectives and voice to deliver value to teams that could be either online or offline in every corner of our shrinking planet. NASA has provided an incredibly powerful life lesson by illustrating the importance of engaging the online crowd to help provide solutions to challenges that they face by understanding that we are all innovators. As I predicted in 2000, this is indeed a Hard Trend that will expand how global citizens collaborate to resolve problems quickly in a 21st-century sharing economy and it is only going to grow and grow. As our world view evolves, more will be adopting this future mindset where people stop thinking about only themselves and concentrate some of their efforts on helping others. This perfectly illustrates how technology really is bringing people together rather than dividing them and this is one side of the story that we seldom get to hear.